Sulfur is element number 16 on the periodic table, with element symbol S and an atomic weight of 32.066. This common nonmetal occurs in food, many household products, and even your own body. Here are 10 interesting facts about sulfur. Sulfur is an essential element for life. It's found in amino acids (cysteine and methionine) and proteins. Sulfur compounds are why onions make you cry, why asparagus gives urine a weird odor, why garlic has a distinctive aroma, and why rotten eggs smell so horrible. Although many sulfur compounds have a strong smell, the pure element is actually odorless. Sulfur compounds also affect your sense of smell. For example, hydrogen sulfide (H2S, the culprit behind the rotten egg odor) actually deadens the sense of smell, so the odor is very strong at first and then vanishes. This is unfortunate, because hydrogen sulfide is a toxic and potentially deadly gas! Elemental sulfur is considered non-toxic. Mankind has known about sulfur since ancient times. The element, also known as brimstone, primarily comes from volcanoes. While most chemical elements only occur in compounds, sulfur is one of relatively few elements that occurs in pure form. At room temperature and pressure, sulfur is a yellow solid. It's usually seen as a powder, but it forms crystals, too. One interesting feature of the crystals is that they spontaneously change shape according to temperature. All you need to do to observe the transition is melt sulfur, allow it to cool until it crystallizes, and observe the crystal shape over time. 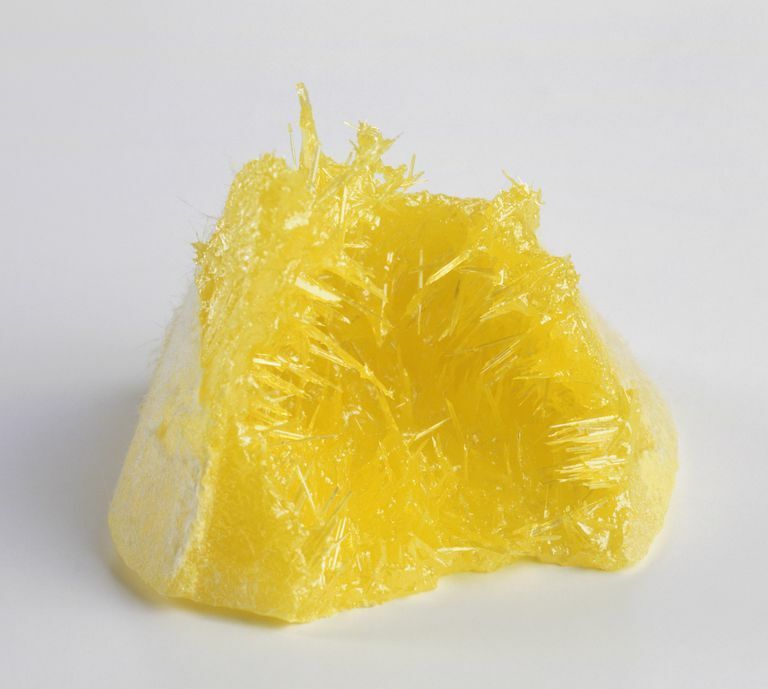 Were you surprised you could crystallize sulfur simply by cooling the melted powder? This is a common method of growing metal crystals. While sulfur is a nonmetal, like metals, it won't readily dissolve in water or other solvents (although it will dissolve in carbon disulfide). If you tried the crystal project, another surprise might have been the color of sulfur liquid when you heated the powder. Liquid sulfur can appear blood-red. Volcanoes that spew molten sulfur display another interesting feature of the element. It burns with a blue flame from the sulfur dioxide that is produced. Volcanoes with sulfur appear to run with blue lava. How you spell the name of element number 16 likely depends where and when you grew up. The International Union of Pure and Applied Chemistry (IUPAC) adopted the "sulfur" spelling in 1990, as did the Royal Society of Chemistry in 1992. Up to this point, the spelling was sulphur in Britain and in countries using the Roman languages. The original spelling was actually the Latin word sulfur, which was Hellenized to sulphur. Sulfur has many uses. It's a component of gunpowder and believed to have been used in the ancient flamethrower weapon called "Greek Fire". It's a key component of sulfuric acid, which is used in labs and to make other chemicals. It's found in the antibiotic penicillin and is used for fumigation against diseases and pests. Sulfur is a component of fertilizers and also pharmaceuticals. Sulfur is created as part of the alpha process in massive stars. It is the 10th most abundant element in the universe. It's found in meteorites and on Earth mainly near volcanoes and hot springs. The abundance of the element is higher in the core than in the Earth's crust. It's estimated there is enough sulfur on Earth to make two bodies the size of the Moon. Common minerals that contain sulfur include pyrite or fool's gold (iron sulfide), cinnabar (mercury sulfide), galena (lead sulfide), and gypsum (calcium sulfate). Some organisms are able to use sulfur compounds as an energy source. An example are cave bacteria, which produce special stalactites called snottites that drip sulfuric acid. The acid is sufficiently concentrated that it can burn skin and eat holes through clothes if you stand beneath the minerals. Natural dissolution of minerals by the acid carves out new caves. Although people always knew about sulfur, it wasn't recognized as an element (except by alchemists, who also considered fire and earth elements). It was 1777 when Antoine Lavoisier provided convincing evidence the substance was indeed its own unique element, worthy of a place on the periodic table. The element has oxidation states ranging from -2 to +6, allowing it to form compounds with all of the other elements except the noble gases.